Leeming Bar was an independent service area, but it was taken over by Moto in 2014. It is no longer directly accessible from the A1 following that road's upgrade. First two hours free for all vehicles, after which cars must pay £15 and HGVs, caravans and motorhomes £16.50. HGVs can pay £18 to include a £10 food voucher. Prices are paid using PayByPhone - more details. The location code is 2524. Leeming started out as the Motel Leeming at the side of the northbound A1, which was expanded and upgraded in 1977 to become a full service area. Since at least 1990 there were plans to upgrade the A1 to A1(M). It was assumed that this would mean the services would close. When more detail became apparent, Coneygarth services was built closer to the new road and visiting Leeming would involve a considerable detour. 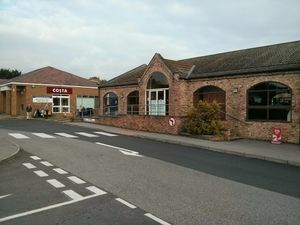 Despite this, Leeming Bar was given permission to continue as a rest area, and Coneygarth wasn't signed at all. It had been suggested that Leeming should be expanded to take advantage of the new motorway, but its independent owners couldn't fund this so sold it to Moto in 2014. This gave them a near-monopoly on services between Blyth and Washington. By September 2014 the petrol station had been changed from Texaco to BP, an established Moto partner. The café had undergone a minor refurbishment and been re-branded as a Costa, though it retained a hot food counter and served EDC products. 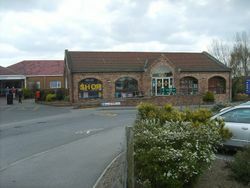 The large shop, the Yorkshire Maid, closed and was replaced by a small shop with WHSmith fittings. The McDonald's remained although offers promoting Burger King at other Moto sites were advertised in the cafe. The lodge retained its independent branding and character as a local amenity, including Benedict's restaurant.